Collins Booksellers - 20 Easy Crochet Patterns Book 1 by Lisa Hamblin, 9781301787142. Buy this book online. 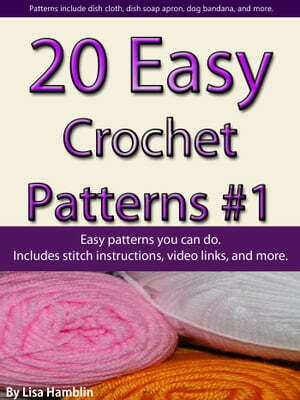 Twenty easy crochet patterns. Easy crochet patterns using the chain, single crochet, single crochet decrease, slip stitch, double crochet, reverse crochet, Bobble and Picot stitches. We include instructions for the stitches as well as videos. Patterns include: Index card holder, baby beanie, baby pigtail hat, baby scratch mitts, barrette, boa scrunchie, bobble coaster, garter, butterfly, can cozy, candy basket, bookmark, bracelet, dainty doily, dish cloth, hanging dish towel, dish soap apron, dog bandana, and doll hood. Many of these patterns you can crochet in an afternoon and make a great gift for your friends and loved ones.